For the past couple weeks I have been fiending for some Ethiopian food. I got my fix last night at Das Ethiopian in Georgetown. Das used to be known as Zed’s. If you liked Zed’s, you’ll like Das…I believe I read somewhere that the owners changed, but that they kept the same chef. Top picture: The dish at the top of the picture is an Ethiopian dried curd cheese plate called Kaisa…gives a contrasting taste to the other food I generally get. The other appetizer in that picture is beef zilzil tibs. Nice and spicy, and slightly crunchy. Good starters. Bottom picture: Lots of stuff going on in this picture. At the top and bottom left is what’s left of the Kaisa/beets/onions from the appetizer. Just above the beets/onions, and also at the top right, is an order of Steak Tartare Kitfo. I’m a big fan of rare meat dishes, although it’s not for everyone. If you don’t know if you are, this is a place to find out (as an aside, I’d also recommend Zaytinya’s Kibbeh Nayah as another great tartare dish). Seen at the middle of the plate is Chicken Doro Wot, served as a chicken leg (it’s a little challenging to remove from the bone if getting your hands dirty is a problem for you) with a boiled egg, topped with a red pepper sauce. The last dishes are vegetarian sides that came with the two entrees. On the menu, I believe these are the Red Lentil Miser Wot (top left) and Collard Greens Gomen (bottom right). Both are good; I especially liked the collard greens, which are mixed with onion and garlic. 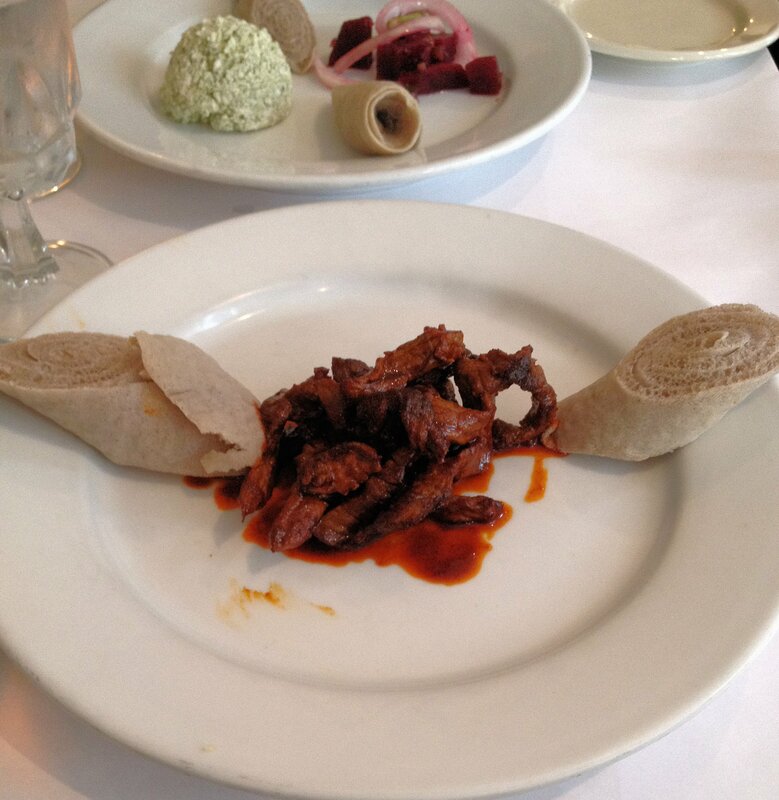 Everything I had was served with traditional injera bread. 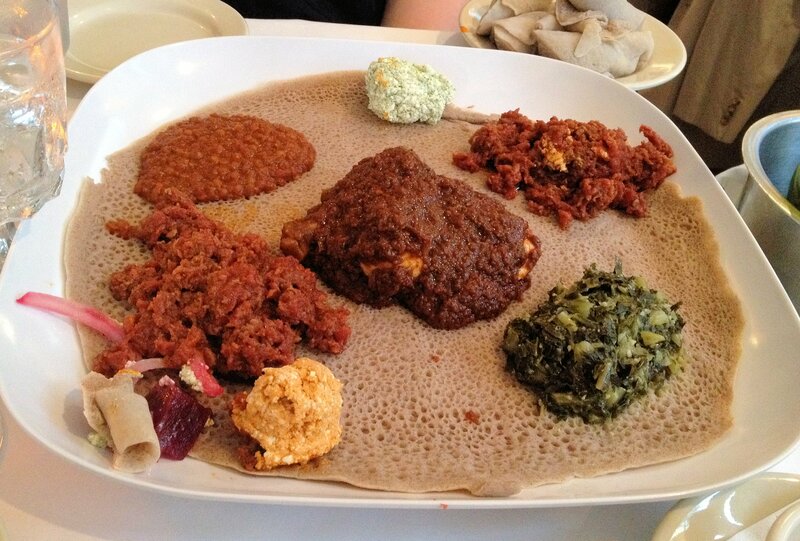 There are no utensils…the food is eaten by scooping it up with the injera. Your fingers WILL be stained at the end of a meal, especially from the darker red and brown sauces, but it will be worth it (and you’ll get some wet naps at the end of the meal). I usually get a bottle of white wine with Ethiopian food. This time I got a Fleur du Cap Sauvignon Blanc from South Africa). Depending on your tastes and your orders, you might want to go with something else. I have a feeling that beer would also go well with the dishes I had, and there is African beer on the Das menu. I’d definitely recommend Das as a great date place with a great menu, and if you haven’t had this type of food before it will be a little adventurous.